Welsh 110m hurdler David Omoregie is aiming to win a place in the Team GB squad for the 2016 Rio Olympics. The 19-year-old receives top level funding for British athletes tipped for potential medal success at the 2020 Tokyo Olympics. "I've got the European Under-23s this year - that's the main target," said Omoregie. "I'm going to give it a go next year for the 2016 Olympics and I'll try my best to make the team." The Cardiff Athletics Club athlete won bronze at the 2014 World Junior Championships in July in a time of 13.35 seconds. In qualifying for the semi-final, the teenager ran the third fastest time in the history of the championships in 13.24 seconds. 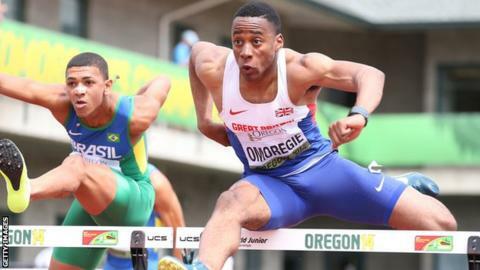 The World Junior Championships in Oregon, in the United States, was Omoregie's first major event as a specialist sprint hurdler since turning from the decathlon. Long term ambitions for the hurdler, who has been compared to former world record holder Colin Jackson, includes the 2017 World Championships in London and 2018 Commonwealth Games in Australia. "They are kind of the big goals for me at the moment," Omoregie told Radio Wales Sport. "For me I just want to progress from last year."